There are times in our lives when we long to challenge ourselves and achieve something great. What that means for each person is relative. And what’s more, it’s specific to where we are in our lives. Perhaps you know already know what your milestone is. Or perhaps you are searching for what shape it will take. Climbing Mount Rainier. Running a marathon or any distance that’s a significant challenge for you. Whatever it is, it will stretch you physically. But there’s so much more to it than that. It’s emotional, social and spiritual. When you achieve a milestone experience, you know you are fully alive. It transforms you. You wouldn’t trade it for anything. While there’s a culminating moment when you cross a finish line or reach the top of a mountain, your milestone experience is all about the journey. Every day you are taking steps to live a more vibrant, integrated, abundant life. Here’s a story of my own milestone experience. On December 1, I ran the St Jude Memphis Marathon. Though I have run many half marathons and shorter races, this was my first full marathon–26.2 miles. I had been training for it for several months, throughout the year I’d put much of my regular life aside to travel regularly from Seattle to my hometown of Memphis to care for my dad who had been diagnosed with pancreatic cancer. By the time the marathon date came into view, I was approaching the event with concern and an open mind, not certain that I would do the race at all. Daddy had been in the hospital the week before. I wasn’t sure how he would be and what I might be needed for come December 1. But as the day approached, he was released from the hospital and had regained energy, it became clearer that I would run, and that he was really excited about it. Race day dawned under intermittent clouds and felt more Spring than Winter. My sister, her teenaged son, my husband were in town too. The race was a celebration of 18,000 runners snaking through downtown and midtown Memphis, past the landmarks Beale St, Sun Studio, Overton Park, my high school, best friends’ homes. Families, cheerleaders, bands, Elvises and Santas lined the streets. The race is a fundraiser for St Jude hospital, so stories of kids’ health struggles were on posters and T-shirts. 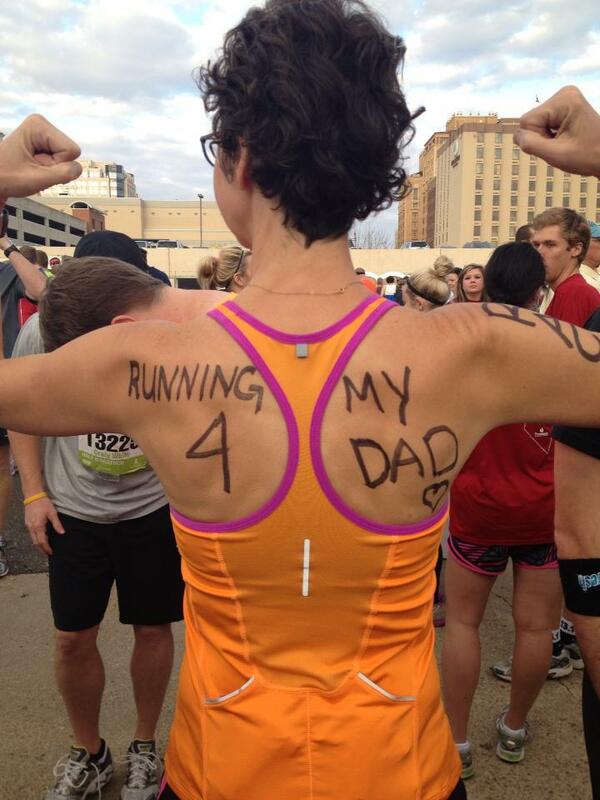 Everyone was running in honor or in memory of someone. I could feel the motivation that came from this. When we runners hit a rough patch, we could tap into the knowledge that someone we love has faced something a whole lot rougher. It was an emotional and spiritual setting. Running for several hours is a meditative backdrop to savor and appreciate the people and things in your life. And that was, for sure, what I did. My marathon was the experience of a lifetime. Not because I finished the distance, or that I did it in roughly the time I’d hoped, but because at miles 1, 9, 14, 17, 21 and at the finish line, my dad and sister appeared to cheer me on and welcome me home. 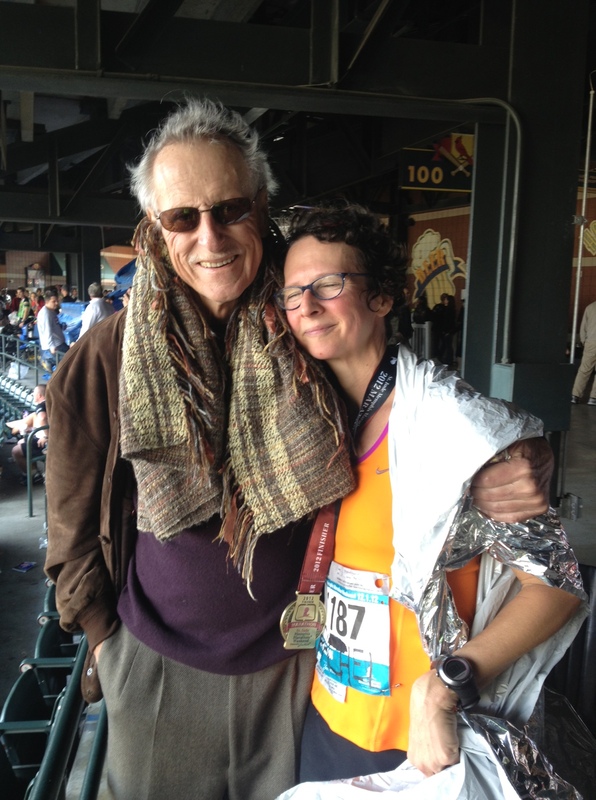 At mile 1, the race course went right by my dad’s house and he, his wife and my sister were on the corner–Daddy in wheelchair–to give me the initial boost. I had created a detailed map with my approximate pace times for my family to use, but I never imagined my sister would get my dad and the wheelchair in and out of the car, and navigate around the closed streets. Each time I saw them, I stopped for exuberant replenishing hugs. Then at mile 23 (Cozy Corner BBQ for those who know Memphis), my husband joined me and we ran the last (fastest!) miles together into Redbird Stadium. That experience, and hugging my proud Daddy at the end, will live in me forever. It was pure joy. My father died just over a month after our marathon. As I move into life without him, I draw strength, joy and a deep sense of closeness with him from that shared experience.